SIOUX CITY, IA - The Sioux City Explorers announced today that the Seattle Mariners have purchased the contract of Explorers LHP Ian McKinney. McKinney will report to spring training with the Mariners when pitchers and catchers report in February to earn a spot within the Mariners organization for the 2019 season. McKinney signed with the Explorers last season on July 12th and immediately made an impact on the X's pitching staff that finished the 2018 season leading the American Association in wins (71), fewest runs allowed (378), fewest earned runs allowed (336), most strikeouts (873), and lowest ERA (3.41). 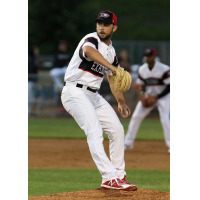 McKinney owned a 2-2 record with a 3.18 ERA with the X's in 2018 after appearing in 10 games (9 starts), tossing 53.2 innings, while allowing just 53 hits and striking out 67. McKinney's impressive 11.2 K/9 was tops for X's starters in 2018. McKinney picked up his first win with the Explorers in his 2nd start for the club after pitching 6 scoreless innings, allowing just 2 hits, while striking out a season high 11 in a win versus Cleburne on July 26th. McKinney reached double digit strikeouts one more time in 2018 on August 31st, where the lefty struck out 10 Texas AirHog batters in only 4 innings pitched in a 14-3 Explorers win. McKinney also shined in the 2018 American Association Playoffs, where he got the start against the Kansas City T-Bones with the X's facing elimination in Game 4, trailing the series 2-1. The Explorers would go on to tie the series behind McKinney's dominant performance on the mound, tossing 7 impressive shutout innings, allowing just 5 hits. With McKinney's signing by the Mariners organization, the Sioux City Explorers have now had 17 player's contracts acquired by an affiliated organization since the completion of the 2015 season; Ryan Kalish - Chicago Cubs, Rob Wort - Boston Red Sox, Patrick Johnson - Pittsburg Pirates, Ryan Court - Boston Red Sox, Noah Perio - Los Angeles Dodgers, Tayler Scott - Milwaukee Brewers, Connor Overton - San Francisco Giants, Lindsey Caughel - Seattle Mariners, Reinier Roibal - Los Angeles Dodgers, Nelson Ward - Seattle Mariners, Kurt Heyer - Miami Marlins, James Needy - Miami Marlins, John Nogowski - St. Louis Cardinals, Kevin McCanna - Arizona Diamondbacks, Tyler Falwell - Philadelphia Phillies, Parker Markel - Seattle Mariners, Ian McKinney - Seattle Mariners.